Every child should feel the joy and cheer of the holiday season. Metalmaster helped spread that message by participating in the Angel Tree Program again this Christmas! 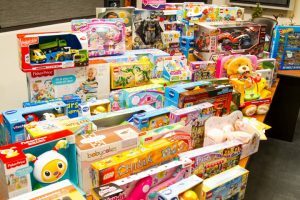 The program is sponsored by the McHenry County Salvation Army along with NBC5 and Telemundo to assist in providing toys to local, needy children during the holiday season. Angel tags were put on a tree in the foyer of our building. Each paper angel listed a specific child, their age, gender and “gift wish”. Any employee, visitor, customer, relative or friend could choose an angel from the tree to sponsor a child. 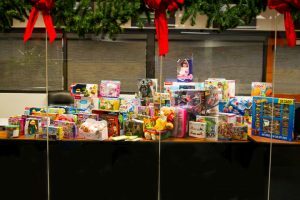 Last year this program was able to provide gifts to over 1,800 local children and our companies contributed to 75 of those! This year we were able to provide 90 gifts! This entry was written by connor, posted on December 8, 2017 at 11:01 am, filed under Company, General and tagged Angel Tree Program, McHenry County Salvation Army. Bookmark the permalink. Follow any comments here with the RSS feed for this post. Comments are closed, but you can leave a trackback: Trackback URL.